Source: Samuel Adams Papers, Volume I, p. 35. Spelling modernized by The Moral Liberal. Emphasis added. THEY WERE BELIEVERS is a project of Steve Farrell and The Moral Liberal. Copyright © 2014 Steve Farrell and The Moral Liberal. Samuel Adams, The Father of the American Revolution and a staunch Puritan until his death, displays, prior to the Revolutionary War, one of the characteristic traits of those Puritans. It is said that one of the reasons given for calling Samuel Adams “The Last of the Puritans,” was the fact that he, was the last man so far as known, in New England who wore the Continental costume. —Fallows,Samuel Adams, 1898. The Last of the Puritans. —Magoon, Orators of the American Revolution, 1860. Crying “No taxation without representation,” he instigated the Stamp Act riots and the Boston Tea Party. After the “Boston Massacre,” he spread Revolutionary sentiment with his Committees of Correspondence. Known as “The Father of the American Revolution,” his name was Samuel Adams, born SEPTEMBER 27, 1722. “We have explored the temple of royalty, and found that the idol we have bowed down to, has eyes which see not, ears that hear not our prayers, and a heart like the nether millstone. “When the Congress met, Mr. Cushing made a motion that it should be opened with Prayer. It was opposed by Mr. Jay of New York, and Mr. Rutledge of South Carolina because we were so divided in religious sentiments, some Episcopalians, some Quakers, some Anabaptists, some Presbyterians, and some Congregationalists, that we could not join in the same act of worship. Mr. Samuel Adams arose and said that he was no bigot, and could hear a Prayer from any gentleman of Piety and virtue, who was at the same time a friend to his Country. He was a stranger in Philadelphia, but had heard that Mr. Duche’ (Pastor of Christ Episcopal Church, Philadelphia), deserved that character and therefore he moved that Mr. Duche’, an Episcopal clergyman might be desired to read Prayers to Congress tomorrow morning. “I trust I have long since made my peace with the King of Kings. No personal consideration shall induce me to abandon the righteous cause of my country. Public liberty will not long survive the total extinction of morals. “A general dissolution of the principles and manners will more surely overthrow the liberties of America than the whole force of the common enemy. This hymn was written by Samuel Francis Smith, who died NOVEMBER 16, 1895. A Harvard classmate of poet Oliver Wendell Holmes, Smith went to Andover Theological Seminary and became a Baptist minister. While a student in 1832, Samuel Francis Smith admired a tune while translating a German Hymnal – the same tune was used for British, Canadian, Russian, Danish, Swedish and Swiss National anthems. “I instantly felt the impulse to write a patriotic hymn of my own, adapted to the tune. 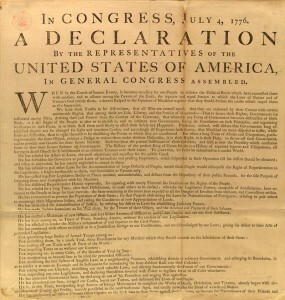 The Declaration of Independence was approved JULY 4, 1776. A few delegates objected, and as the Declaration needed to pass unanimously and time was running short with the British invading New York, the line condemning slavery was unfortunately omitted. Next to sign was Secretary, Charles Thomson, age 47. “We must hang together or most assuredly we shall hang separately. Many of the 56 signers sacrificed their prosperity for their posterity. 9 died during the war. 27-year-old George Walton signed, and at the Battle of Savannah was wounded and captured. Signers Edward Rutledge, age 27, Thomas Heyward, Jr., age 30, and Arthur Middleton, age 34, were made prisoners at the Siege of Charleston. 38-year-old signer Thomas Nelson had his home used as British headquarters during the siege of Yorktown. Nelson reportedly offered five guineas to the first man to hit his house. Signer Carter Braxton, age 40, lost his fortune during the war. 46-year-old Richard Stockton signed and was dragged from his bed at night and jailed. 50-year-old signer Lewis Morris had his home taken and used as a barracks. 50-year-old signer Abraham Clark had two sons tortured and imprisoned on the British starving ship Jersey. More Americans died on British starving ships than died in battle during the Revolution. 53-year-old signer John Witherspoon’s son, James, was killed in the Battle of Germantown. 60-year-old signer Philip Livingston lost several properties to British occupation and died before the war ended. 63-year-old signer Francis Lewis had his wife imprisoned and treated so harshly, she died shortly after her release. 65-year-old signer John Hart had his home looted and had to remain in hiding, dying before the war ended. “I am apt to believe that it will be celebrated, by succeeding generations, as the great anniversary Festival. It ought to be commemorated, as the Day of Deliverance by solemn acts of devotion to God Almighty. “You will think me transported with enthusiasm but I am not. I am well aware of the toil and blood and treasure, that it will cost us to maintain this Declaration, and support and defend these States. Yet through all the gloom I can see the rays of ravishing light and glory. I can see that the end is more than worth all the means. Bill FedererThe Moral Liberal contributing editor, William J. Federer, is the bestselling author of “Backfired: A Nation Born for Religious Tolerance no Longer Tolerates Religion,” and numerous other books. A frequent radio and television guest, his daily American Minute is broadcast nationally via radio, television, and Internet. Check out all of Bill’s books here.